Prepared by Mamata Chithriki, MD, Shahzad Sadiq, MD, and Moneer Jaibaji, MD, St. Joseph Mercy Oakland Hospital, Pontiac, MI. A 67-year-old woman presented with weight loss, loss of appetite, and early satiety. Her symptoms had been exacerbated by stress. She had no other significant medical history and was not taking any regular medication. An upper gastrointestinal (GI) series was performed (Figure 1). The upper GI series showed an antral ulcer with a fistulous connection to the duodenum, also known as a "double pylorus." Esophagogastroduodenoscopy was performed and revealed two openings from the stomach: one the normal pylorus and one opening that appeared edematous at the margins with a clean-based ulcer, representing a gastroduodenal fistula (Figure 2). Biopsies of the ulcerative region were negative for Helicobacter pylori . The patient was treated with a proton pump inhibitor, and her symptoms resolved. Afollow-up endoscopy 8 weeks later revealed resolution of the inflammatory changes with a persistent gastroduodenal fistula (Figure 3). 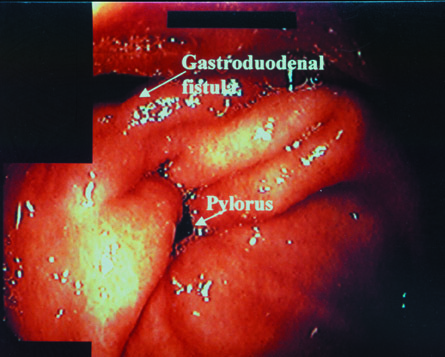 Double pylorus or gastroduodenal fistula is an unusual, but recognized, condition in which two pyloric openings connect the gastric antrum to the duodenal bulb. The two openings are separated by a septum or bridge of tissue covered by gastric epithelium. 1 Congenital and acquired forms of this condition can occur. The congenital form is reported to occur equally in both sexes and its etiology is unknown. 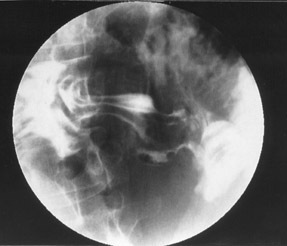 Criteria for entertaining a congenital origin include: A) no clinical history of peptic ulcer disease and no evidence of ulcerative changes on imaging studies either radiographically or endoscopically; B) recognition at a very young age; C) histologic features, including the presence of mucosa, submucosa, and muscularis propria in the second channel; D) spontaneous or drug-induced motility in both channels; and E) other associated congenital abnormalities, such as heterotopic pancreatic tissue or gastric duplication. 2 Congenital origin of the double pylorus is rare in comparison with the acquired form; one series reported that it occurred in only 5 of 60 cases. 2 Complete tubular duplication of the pylorus was reported in one series of congenital lesions of the upper GI tract as occurring in only 1 anomaly in a collection of 281 lesions. 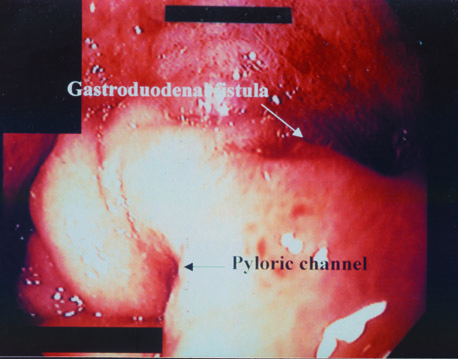 3 As with GI duplications at any level, ectopic gastric mucosa can exist in the second pyloric channel. These areas can be symptomatic, as they have a propensity for similar complications, such as peptic ulceration that can arise in normal gastric mucosa. The acquired form of double pylorus, which appears more commonly, has a male predominance of 2:1 4-6 and is postulated to be a sequela of peptic ulcer disease creating a GI fistula. The sequence of events has repeatedly been shown as follows: 1) formation of peptic ulcer in gastric antrum or duodenal bulb; 2) penetration of this ulcer leading to adhesion formation between the adjacent stomach and duodenal walls; and 3) continued penetration along the muscular layer resulting in a fistulous tract. Generally, patients present with symptoms of abdominal pain and GI bleeding or anemia. Most patients reported having experienced symptoms for >2 years prior to the identification of the gastroduodenal fistula. 7 Patients with the acquired form have an increased incidence of associated systemic disorders. Studies have failed to elucidate a more active progression of peptic ulcer disease resulting from the existence of the double pylorus. There have been, to our knowledge, no known cases of free bowel perforation or gastric outlet obstruction, nor have there been reports of localized infection or bile reflux gastritis. There have been no known associations with the development of this condition with gastric malignancy, nor is there any known association of increased gastric acid secretion or Zollinger-Ellison syndrome. Radiographic findings on double-contrast studies are characteristic, showing two linear barium-lined channels in the pyloric region separated by a nonopacified segment, the septum. Reports have documented this appearance being misinterpreted as polyps, tumors, or large mucosal folds, however. 7 Prone barium-filled views frequently reveal the double pylorus optimally. The application of pressure on the abdomen may assist in better opacification of both channels with barium. 8 Unless the radiologist is aware of this entity, it may be overlooked on contrast studies. The findings on endoscopy clinch the diagnosis, with the orifice of the fistula being noticeably visible adjacent to the pylorus. However, on occasion, insertion of the biopsy forceps or the endoscope itself through the fistula may be essential in documenting the fistulous connection. Care must be taken to adequately distend the antrum with air such that large gastric folds do not obscure a small fistula. 8 Ulcer formation most commonly occurs on the lesser curve of the gastric antrum adjacent to the fistulous tract and connects to the superior aspect of the duodenal bulb. Only about half of patients with double pylorus have been shown to harbor H pylori bacteria. 9 The patient reported here also failed to demonstrate the presence of H pylori . Treatment recommendations have included avoidance of ulcerogenic medications and the institution of intensive and complete antiulcer treatment as soon as possible. Triple therapy should probably be recommended in patients who are positive for H pylori , though no significant benefit has been shown from its eradication in symptom resolution, decreasing ulcer recurrence, or in fistula closure. Fistula closure has not been shown to occur in the majority of patients with this condition despite resolution of symptoms, as was the scenario with the above-described case. Fistulas often remain patent or converge to form a large single opening following the destruction of the septum from penetrating ulcer formation. Surgery is an alternative for the treatment of double pylorus, particularly in patients with refractory symptoms, recurrent ulcers or other complications. 9 The findings of one series that reviewed a total of 53 cases suggested that only 20% of cases required surgery, while 80% had been successfully managed medically. The double pylorus appears to be a complication of peptic ulcer disease, which in many cases can be managed by medical therapy without complications. Surgical intervention may be necessary for the usual critical complications of peptic ulcer disease or long-standing symptoms.